Hi. I’m Jessica. I REALLY love to be cozy and anything that I can wear that simultaneously acts as pajamas is a win in my book. I’m not sure if you all have seen, but there are some new products on the market and, at first, I wasn’t sure how to feel about them. Two new yarns hit the stores - Buttercream Loopity Loops and Bernat Alize EZ - both of which have pre-made loops throughout the entire skein. 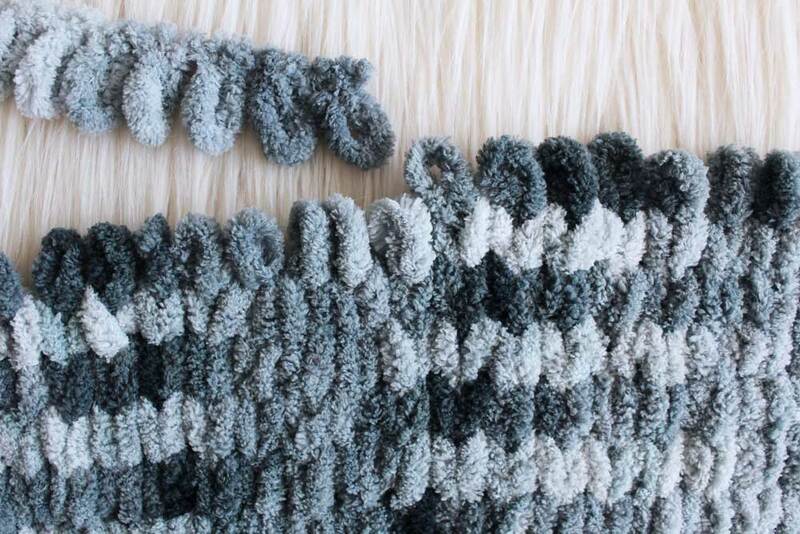 It is geared towards those wanting to do finger knitting and is a pretty awesome concept! This is a personal blog. All editorial content and projects are intellectual property of Jessica Carey, designer of The Hook Nook. This post was sponsored by JOANN Stores but all ideas and opinions are my own. When I finally had a moment to sit down and play with this stuff, my fingers fumbled a bit and it was hard to coordinate the stitches because these were all new movements. It was a bit slow to start, but once I found a groove, OH MY GOSH. I can’t even tell you how fun this stuff is. I literally sat and just finger knitted for three hours at the coffeehouse the other day and completely lost track of time. Such a relaxing project!! At first, I was worried that, like knitting, the loops would fall through and completely ruin the work you had already done. I mean, that’s the number one thing that I find most frustrating when I knit. I’m still a novice and when a stitch drops, I basically give up. 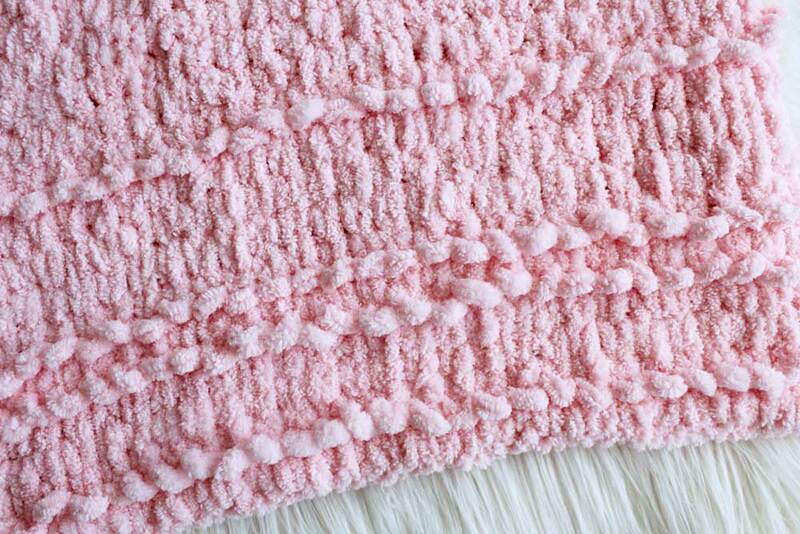 However, with the make up of this yarn being very similar to Bernat Blanket yarn, the material does not slip easily, unless pulled. I am able to work a few stitches or rows, set it down and know that I don’t have to worry about slipped stitches. Even if stitches slip, it is extremely easy to recreate it and move on. Such a fun finger dexterity and mindless and relaxing craft!! 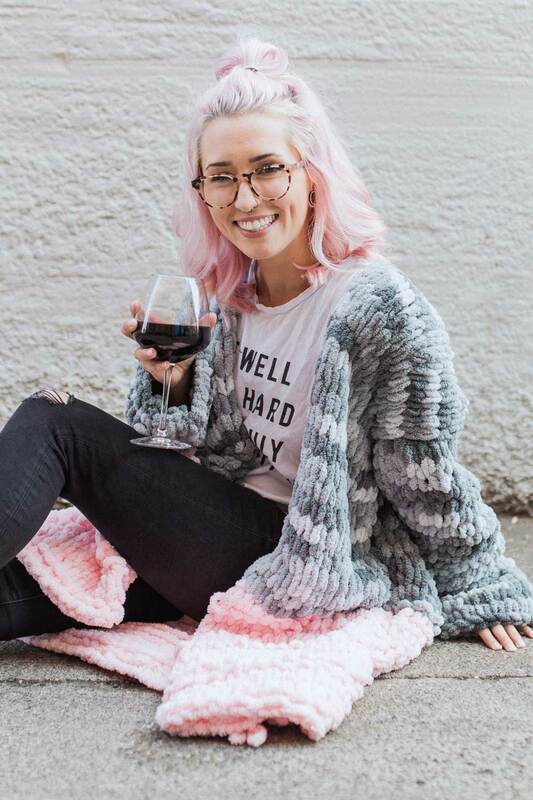 So, after a lot of playing around, I am so excited to introduce you to my new Namaste At Home Cardigan which is about to be your newest best friend. 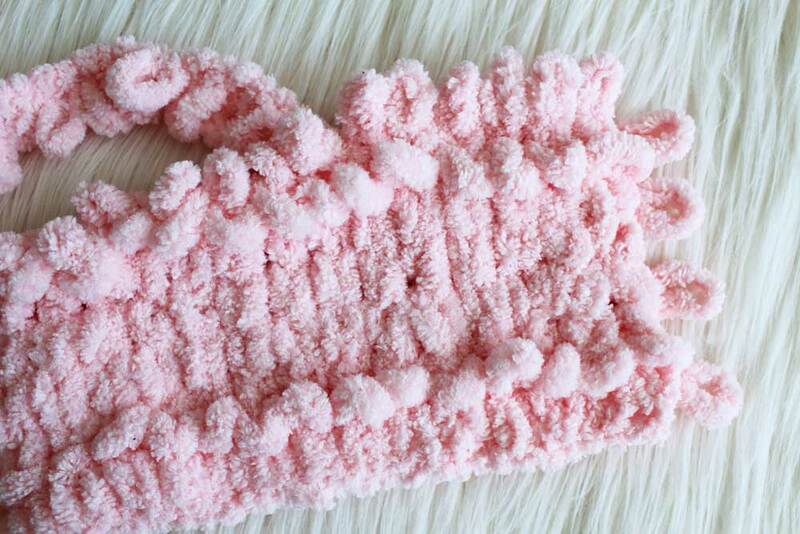 The yarn is the softest and squishiest material and with the oversize design, you will NEVER take the thing off. I guarantee it. ;) I’ll even pour you a glass of wine. Using the new Loopity Loops and Bernat Maker EZ yarns, I’m so excited to have a legitimate reason to never leave the house. 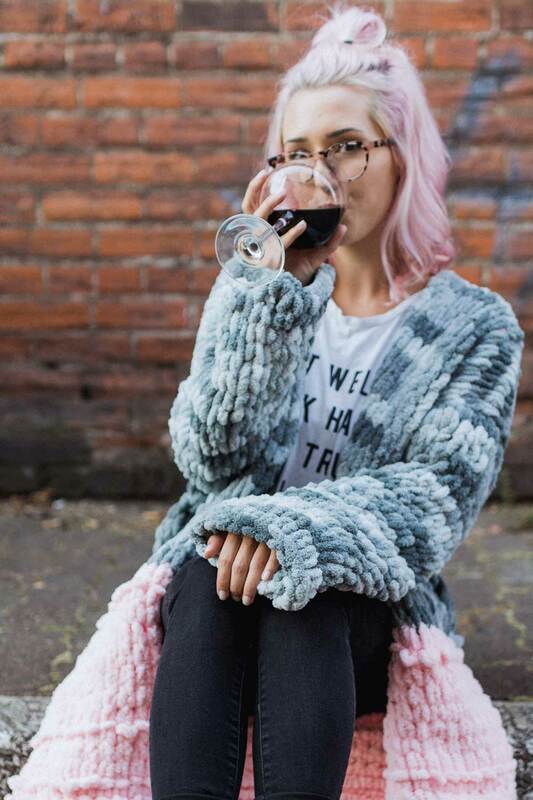 I mean, who DOESN’T want to be cozied up in this coziness all flipping day?! The Namaste At Home Cardigan is the perfect project because of the relaxation of working with these particular products. Once finished, you now have the ultimate Maker getup for all of the creating you’re about to do. Needles : none - fingers! For this project, I chose to not turn my work. I worked left to right then right to left, with the right side facing me at all times. This allowed me to keep a better eye on the design. 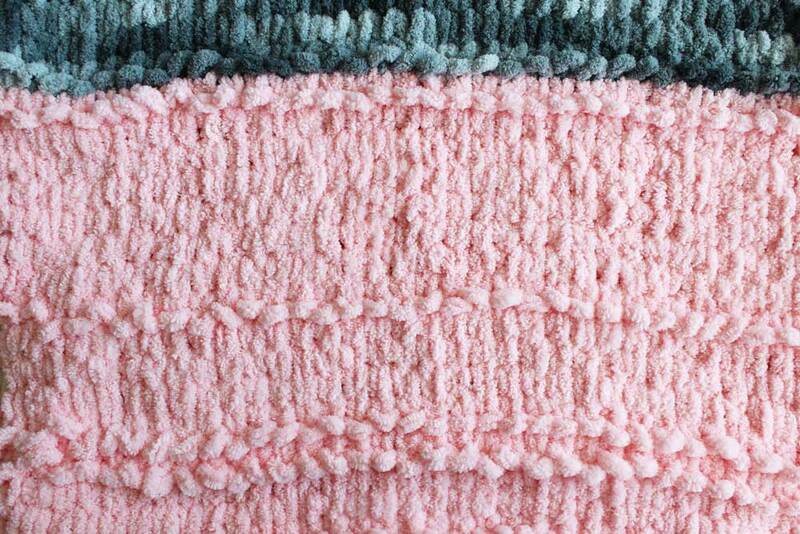 We are using primarily stockinette stitch for the entirety of the cardigan with occasional purl rows to add texture and interest. 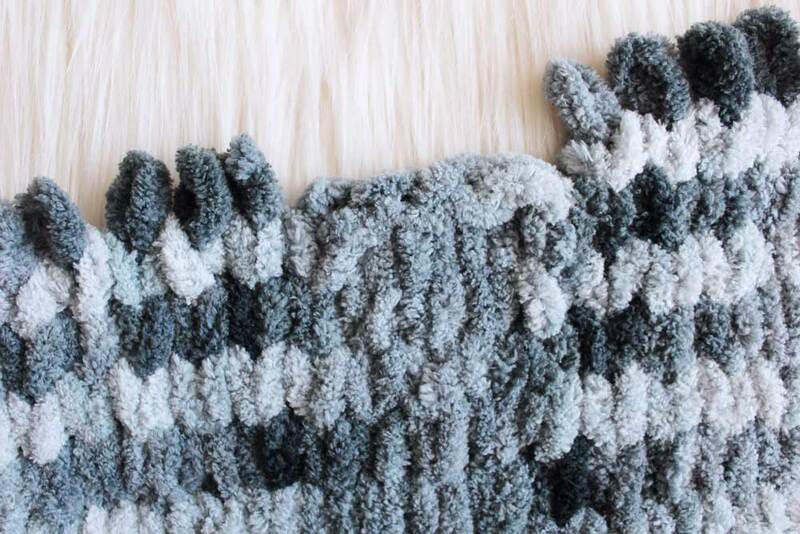 Practice the different stitch techniques for this yarn by following along with these great video tutorials hosted by JOANN Stores. [Color B] Starting at the beginning of the skein, count 36/37/38/39/40/40 loops. Note: Keep right side toward you at all times. Wrong side should always be facing away. We are not turning our work. After Row 81/89, finish off leaving a few loops as a tail. We will now go back up to the remaining unworked Row 44. Both front panels will have 5/6/5/6/7/7 unworked loops between them. Cast off these five sts. Repeat Rows 44/48 - 81/89 for second front panel. [Color A] Count 21/22/23/24/24/24 loops. Lay back panel down with right side up. Lay both front panels on top of the back panel, with wrong side facing up. Line up your excess loops and alternate replicating (k, p) across. For the first loop pair, place the back loop up through the front loop. For the second loop place the front loop back through the back loop. Alternate up the seam towards the sleeve section. Leave a 7.5”/7.5”/8”/8.5”/8.5/8.5”” hole opening for the placement of the sleeves. Fasten off, weave in ends/loops. Repeat for opposite side seam. Lay sleeve down with right side up. Fold in half, connecting both long sides. 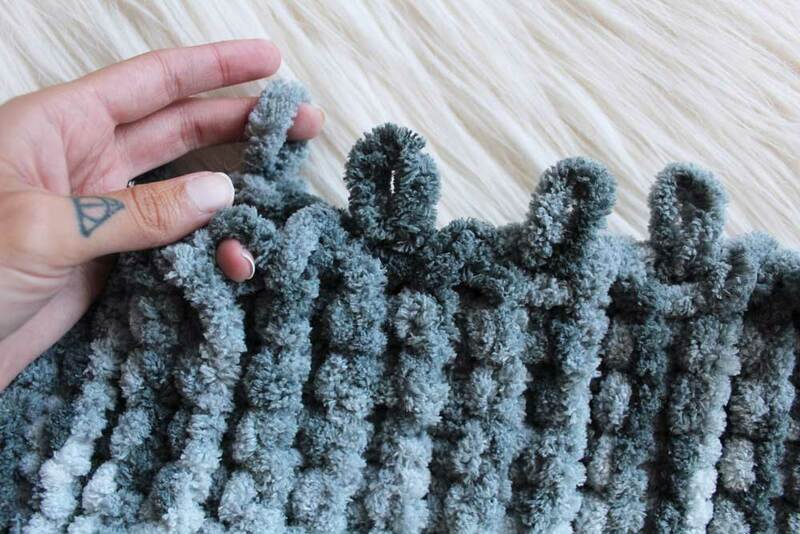 Line up your excess loops and set them through the other side of the sleeve. Slip the loops through each other to seam up the sleeve. After both sleeves are seamed, lay them next to the arm hole sections of the body. Be sure that both the body and sleeves are wrong side out. This keeps the seams inside the garment and hidden when worn. Using the leftover loops on the body, place them through the sleeve. Seam up the sleeve section. Remember, you can get a downloadable, printer-friendly version of the Hooded Bliss Blanket crochet pattern on Etsy, Ravelry, and Love Crochet! Thank you for supporting me!! Don't forget to share your progress online and use hashtags #handmadewithjoann and #thehooknookers so share with our communities! Be sure to follow along with me on Instagram to see more fun inspiration and stay in the loop with whats to come! 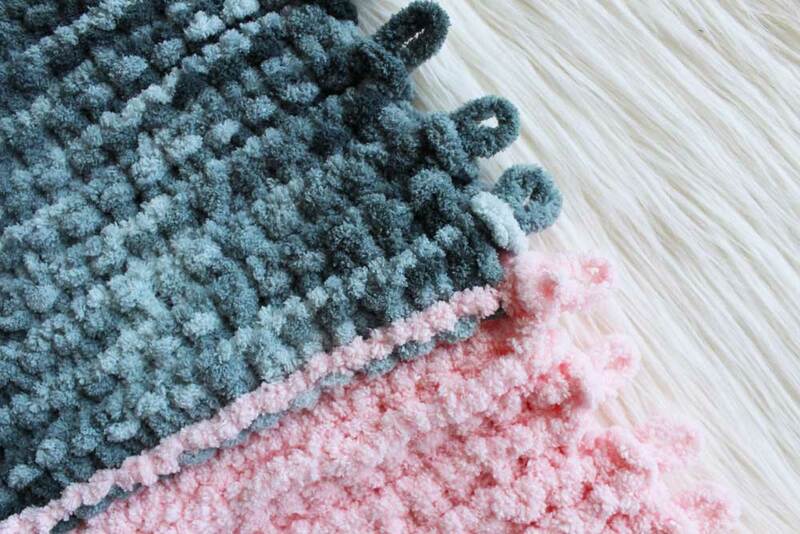 Thank you to my friends at JOANN Stores for helping me create such a fun project! 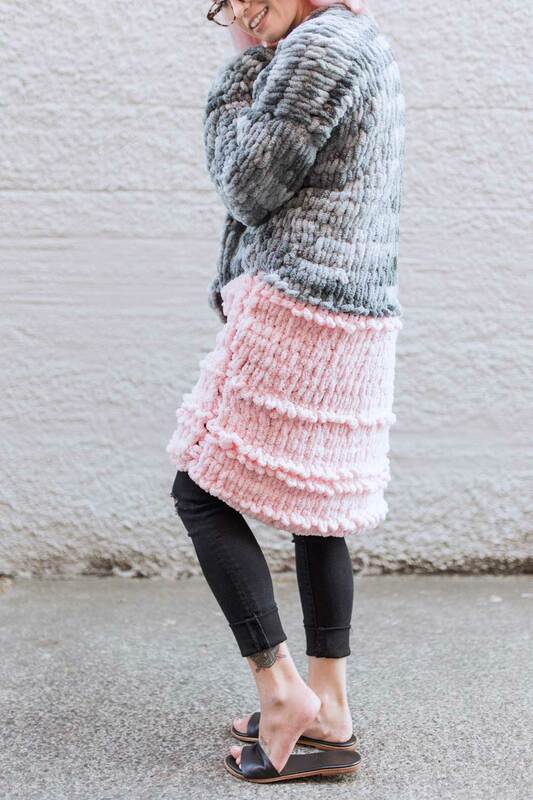 Want to check out more beautiful, modern crochet and knit patterns? 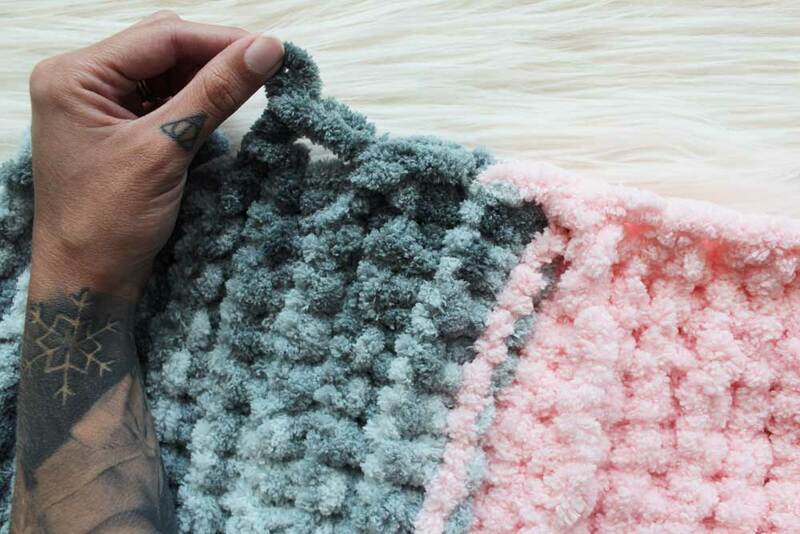 Check out ALL of our blog posts featuring patterns, projects and more designed and shared by some of the community's best designers and dreamers here on THNLife Blog! Again, don’t forget to share images online using #thehooknookers so we can all see your beautiful work, as well as for a chance to be featured on @thn.life! See you all there!